Maine’s Linda Leach’s journey through polymer reads like a 13-year odyssey through classes and guilds and experiments in her own multi-media style. 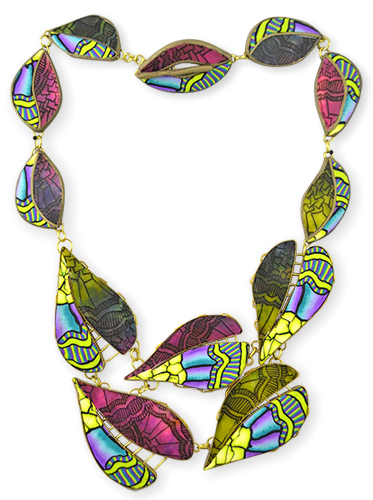 Linda’s voyage and this necklace brought her a 2017 Niche Award in the Polymer Jewelry category. She created the necklace for #39 of last year’s weekly polymer challenge. Linda called it, “…a wild new piece that I know is over the top, but I love it anyway.” The necklace incorporates leaves bound in brass strips and brass wire with polymer clay cane work as well as her liquid clay/alcohol ink over etched copper technique. The cane repeats the design on the etched copper. You can watch her step-by-step work in progress on her blog. Learn more about Linda on her site (Dancing Dragonflies), Facebook and Etsy. Kudos to Linda and what she’s accomplished. Where is your art odyssey leading you? Gorgeous and fun piece. I can see why it got the coveted Niche! Lots of play-value here, both visually and tactilly (? is that even a word). Thank you for bringing this to our attention.